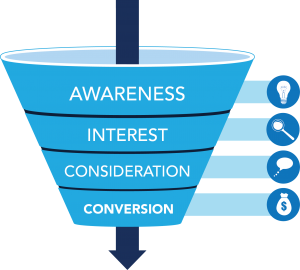 The conversion funnel helps illustrate a consumer journey from awareness to conversion. This is what made marketing “click” for me, and led me to pursue a career in the industry. Fast forward 10 years and I still use it to identify different marketing objectives I want to accomplish. Like a machine, the funnel has multiple moving parts that help lead someone to convert. In this article, I’ll describe how each stage works and share ideas I have used to drive people down the funnel. The first stage of the funnel is generating awareness. This could be the first and only interaction you have with the consumer, so making a good first impression is important. Communicate who you are and what it is you do. For example, if you own a restaurant, what’s the name of the restaurant? What type of cuisine is it? You could be the solution to someone’s need or desire, so make that clear upon finding you. Blog posts – At the awareness stage, you’re looking to identify a problem someone is dealing with. For example, a blog post titled, “5 Ways the Purchasing Funnel can Drive More Leads,” is intended for someone looking to drive more leads. If they view this as a possible solution to their problem, you have successfully driven them to the next stage. Social Media – Social media can be an effective tool to gain awareness for your brand. Design ads and target custom audiences based on their personas. Webinars – If you have information you would like to share with your audience, host a webinar. They are a great way to establish yourself as an expert in your industry. Promote your webinar by setting up social and email campaigns. Adwords – Google Adwords gives you the ability to create awareness through search ads, display ads, video ads and even mobile ads. Start small and test a couple different campaigns to see what works best for your business. Video Ads – With Youtube, you can create custom video ads to promote your brand. These ads play before a video and can be targeted to videos relevant to your brand. Speaking Engagements – Research industry events that your customers attend and ask if they have any speaking opportunities. Like webinars, speaking engagements are a great way to establish yourself as an industry expert. Podcasts – Podcasts are another great way establish yourself as an industry expert while reaching a wide audience. If you have the resources, look at possibly hosting your own podcast. If not, research various podcasts that your customers listen to and inquire about guest speaking opportunities. Once a customer is interested in your brand, chances are they will want to learn more. Find ways to target them by using information you’ve learned up to this point. You haven’t sold them yet, but you’re one step closer. Newsletters – Newsletters are a great way to keep your audience up to date with all the latest company news. To give them a reason to sign up, try offering an incentive. Social Media – At this stage, keep followers up to date with your brand by posting blogs, case studies and images of your team. Use insights to find out the most effective times to post your content. Case Studies – A case study is a great way to showcase descriptive information and data from an experiment, project, event or analysis. Like blog posts, case studies can live permanently on your site and can help to drive search traffic to your site. Blog posts – Blog posts can be used to generate awareness and interest. They can be an effective way for someone to learn more about your brand and the solutions you offer. Retargeting Ads – Retargeting ads work by targeting your ads to people who have recently visited your site. According to Google, 2% of shoppers convert on the first visit. Retargeting works to bring the other 98% back to your site in hopes they will convert. Dynamic Retargeting Ads – Dynamic retargeting ads allow you to show previous visitors ads that contain products and services they viewed on your site. At this stage, the consumer has identified your brand as a viable solution. Final research is done to see if they want to move forward with the purchase. This is where managing your online reviews can be important. Consumers will often check reviews to verify they want to move forward with the purchase. Having a lot of negative reviews could be the deal breaker. A quick way to check your reviews is by running a Google search. For example, if I wanted to look up reviews for JEBCommerce, I could search, “JEBCommerce reviews.” Top search results will show sites where your business has reviews. If you find out you have a lot of negative reviews, look at ways to address this. At this point, you have convinced someone that your product or service is worth purchasing. However, your work isn’t done yet. It’s important that the product/service meets the description. As long as they’re happy with their purchase, there’s a chance they will become a loyal customer. A lot of businesses depend on loyalty in the form of return customers. Loyalty isn’t guaranteed but if your product or service met or exceeded their expectations, there’s a chance they will return. Point System: This is one of the most common loyalty programs around. Frequent customers earn points which translate into a reward of some kind. VIP Programs: VIP programs work by charging an upfront fee to access additional benefits. Amazon Prime is a great example of a successful VIP program. By paying a annual fee, Amazon customers receive free 2 day shipping on all orders as well as a list of other benefits. Games: This is a fun way to keep customers coming back. An example of this is Mcdonald’s Monopoly game. Frequent customers will earn game pieces each time they purchase a meal. After collecting the correct pieces, customers can earn rewards. Be Unique: Some brands gain loyalty by simply standing out among the competition. Apple has done a terrific job gaining loyal customers without offering discounts or rewards. They achieve this by focusing on innovation. Apple seems to always be setting the bar in their industry. It’s imperative to clearly identify who your target market is. This will help you determine which type of content is effective in attracting your customers. It’s not a one size fits all plan, test different strategies to see what works best for your brand. Use data to determine which methods are producing the best results. Have a strategy that works well for you? Let us know, we would love to hear about it!